1984. Hoshikin Koi farm – Shiodani village. Katsusige Hoshino was introduced to me by one of the auction staff after an auction I attended at the Nokyo site near Iwamagi village where he presented me with his business card. 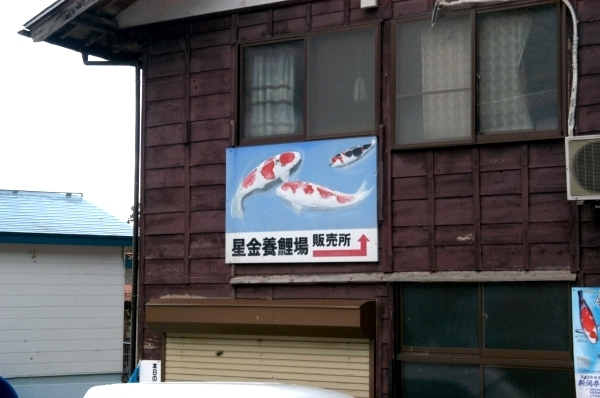 These were the times when the only word for Kohaku around the mountains seemed to be ‘Dainichi’. However, there were some others dedicated to stealing the crown. A few days later, I gave his card to Naoji Takanashi who, by then, had opened his own Koi ‘resting facility’ close to Narita airport to handle my ever-increasing volume of Koi purchases. Naoji asked Hiroshi Kawakami as to where Shiodani village was as he had never been before – Hiroshi drew a quick map on a piece of paper linking the village to Nigoro. Eventually we both discovered Shiodani for the first time. Upon arriving at the house we were greeted with a chained Siberian Husky who seemed to be in charge. Soon afterwards Hoshino San came to the door and took us to his indoor Koi house which was situated above his house and accessed by concrete steps. There were also two outdoor concrete ponds to the rear of his house. Upon entering his Koi house for the very first time I quickly realised one thing, and that was – if you wished to buy Kohaku, you have come to the right place! There was not one other variety displayed at the Hoshikin farm – anywhere at all! When I inquired as to the original bloodline of his stocks, Hoshino San became a little vague as if he did not wish to reveal any of his secrets but he did say that some of his parents originated from Kohaku produced here in his home village and had later been introduced to his other parent stocks from actual bloodlines. We must have spent two hours or so closely inspecting his tategoi which were kindly netted and bowled before us whilst Hoshino San related their finer points to us. I bought four or five nissai here on my first visit and they were the very first Hoshikin Kohaku to enter the UK. My first impressions – ‘the start of something big’.